Number : Season 12, episode 3 of 4. Which one : The Dalek beginning. Plot : The Doctor, Sarah-Jane and Harry have their transmat journey back to space station Nerva intercepted by the Time Lords. They are sent on a sabotage mission to the last days of the Kaled/Thal civil war – on Skaro and the beginning of the Daleks. Whats good : The Kaled/Thal civil war, on Skaro. The events leading upto the creation of the Daleks, under the direction of Davros. “Do I have the right?” speech. A different angle on the Daleks. Whats bad : Mainly SFX, Davros’ mask looks a little too rubbery now and the Dalek embryo’s look like something coughed up from a lung infection. Review With Spoilers : Another gem, with the 3rd episode of season 12. Taking the Daleks and doing something different with them, by giving the viewer an origin story and the introduction of their creator; Davros. There is alot of good ideas going on here, from a concept angle. For instance, we get to see the last painful days of the civil war on Skaro, where both Kaled’s and Thal’s are fighting with only basic technology left. Due to all other resources having been used up over 100’s of years of stalemate and dwindling resource. Baker’s Doctor finally gets to lock horns with the creator of the Daleks; Davros – after years of battling his Dalek creations. Their shared verbal sparring, is by far the most interesting spectacle here. That is, apart from Baker’s excellent moral searching, “Do I have the right?” speech. As he stands with two paired detonator wires, ready to blow up the Dalek embryo chamber and kill them – before they even begin. The Hitler and Nazi parallels drawn between the Davros and the Daleks, is tangible here. Even down to the grey Dalek prototype shells, the militarial heel clicking of Davros’ Kaled soldiers and Davros’ rambling speeches of “total power!”. Davros’ right hand man; Snyder (Peter Miles) is particularly devious (and snidey?) and has more than a passing resemblance to Brick Tamlin from Anchorman, with his severe side-parting and little round glasses. Peter Miles played a similar part in the Pertwee adventure Invasion Of The Dinosaurs. The emotional human condition is on trial here too. 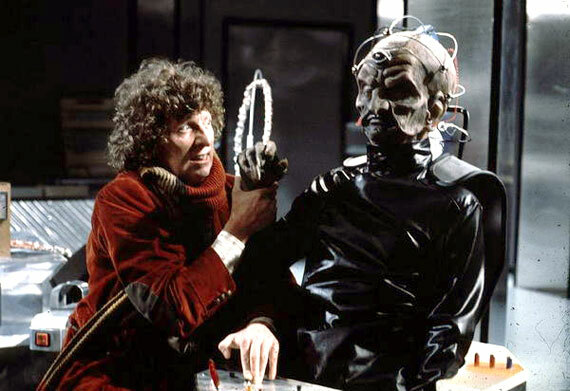 As Davros extolls the virtues of banishing all of the “weak” traits from his new evolved Kaled fighting machines. Only to succumb to his own creation, simply because the Dalek creator makes them; too ruthless. Genesis Of The Daleks is testament of taking something staid – like the Daleks, unwinding their lore and doing something a bit different with them.